The discipline of systematic evaluation through applying process-flow and decision analysis — in this example, of financial logic — can help make reasoned, practical decisions, whether for interest rates, or for resolving issues in power supply, or in telecommunications, spectrum and broadband. Shyam Ponappa's article was published in the Business Standard on July 5, 2012. Several analysts applauded the Reserve Bank of India’s (RBI’s) resisting cutting interest rates despite declining growth. Some quoted monetary theory to justify this; others praised the regulator’s standing-up-to-government stance. Meanwhile, the nation groaned, waiting for relief. Is this just the vaunted animal spirits in reverse, that perceive a half-full glass as half-empty? Or is there substance to the frustration of those who function in the real-world marketplace, who deliver products or services and expect rational solutions? each item in crores; the second shows each item as a percentage of total revenues including other income. Consider the expense in the interest and net profit columns, shown in the second column as 11.1 per cent and 8.8 per cent of total revenues. 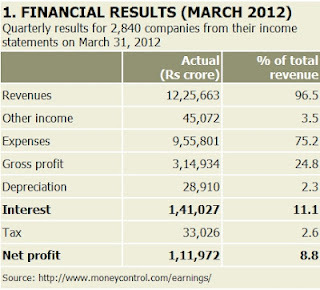 Total revenues for these companies grew about nine per cent from December 2011 to March 2012. 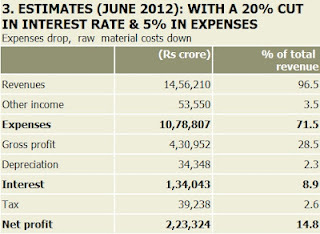 Assume conditions remained the same for the next quarter to June 2012, except for one item: the RBI cuts the repo rate by 20 per cent, so interest expense amounts to 8.9 per cent. Revenues grow as in the previous quarter – because conditions are turbid, to say the least – by nine per cent, and the only change in costs is the drop in interest expense to 8.9 per cent. for simplicity). 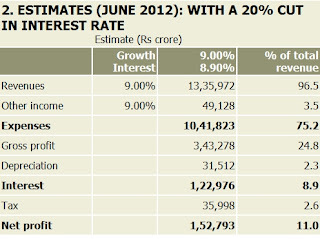 Note net profit, which was at 8.8 per cent in March 2012, increases to 11 per cent in June 2012. If nothing else changes for the year, no costs, no animal spirits, net profit in succeeding quarters will be 11 per cent instead of 8.8 per cent of revenues. Now consider the further effects of the ongoing drop in raw material prices. If raw material costs were to reduce so that expenses fell by, say, five per cent, total expenses would fall from 75.2 per cent to 71.5 per cent of revenues, and net profit would grow from 11 per cent to 14.8 per cent of revenues. In other words, in one quarter, this reduction in interest cost could take net profit from 8.8 per cent to 11 per cent — and, if it were possible to capture the drop in input prices, even to 14.8 per cent of revenues. Figure 3 shows what June 2012 would then look like. This example involves no hypotheses or theories; just arithmetic. The reality is likely to be different, because there will be changes like the extent of pass-through of a cut in RBI rates, inflation, the extent of labour troubles, seasonal effects on sectors that affect buying, production and so on. The purpose of this example is to show that a reduction in borrowing costs would yield higher profits. These profits could enable companies to muster cash and borrowings to capitalise on falling raw material prices, as they have in the past. To the extent that they can do this, net profits would increase, resulting in increased GDP because of increases in corporate and proprietary income, employee compensation, as well as higher tax collections and increased investment. Another level of complexity arises from global responses to these developments in India, assuming for the moment there are no major negative global events. How are investors likely to respond to higher growth in India in the context of problems with stranded power generation, choked logistics, resurgent populist activism with a weak Centre and assertive states, and uncertain telecommunications reforms? Will a reduction in oil prices translate to lower or higher inflows from foreign institutional investors? And so on. The denouement of developments in Greece, Spain and Italy may affect India significantly. Likewise, developments in America will also have significant effects. The point to consider, quite simply, is this: if profits increase, investment is also likely to increase. Would we rather be dealing with these circumstances from a position of relative strength, or of comparative weakness? It is not clear whether analysts and practitioners, including the RBI, used planning models based on the process flow of financial logic to test their assertions. For instance, for realistic scenarios based on recent circumstances, what are the likely outcomes of increasing interest rates, holding them steady, or, as in the example above, reducing them? Or are such models considered too simplistic? The logic can be evaluated in the process flow, and the possibilities laid out in a decision tree with likely outcomes. Probabilistic forecasts can be input as distributions linked to probabilities to analyse probability-weighted outcomes instead of simplistic point estimates, before deciding on the appropriate action. This process of decision analysis can be usefully applied not only for interest rates, but also for resolving problematic issues in electricity supply, or telecommunications, spectrum and broadband policies. A second element that is useful for result-oriented decision making in intractable areas like power supply and telecommunications is participative problem solving, as in the process that led to the successful breakthrough of the New Telecom Policy, 1999. If the government and stakeholders adopt this approach, prospects of a higher growth trend may indeed be realised, despite the doubts being expressed about higher sustainable levels.